The Cake baked beautifully. The icing was another matter. I used 16 oz of cream cheese, 2 lbs of powdered sugar and 2 teaspoons of vanilla. My icing was quite runny. Thankfully, I knew not to include the milk because I could see that the consistency was not quite right. Not sure what happened with the icing but it did not turn out as it should. I used it to frost the cake but it ran out between the layers and down the sides, puddling on my cake plate. It is in the freezer. Hope that helps. You didn’t add any liquid and it was runny? You used the blocks of cream cheese that are solid but slightly soft ? The cakes were completely cool? Im so sorry you had trouble with it. The good news is I’m confident it will still be delicious but I can’t think of what went wrong with the frosting. Thanks for letting me know. Yes, it was runny. I used 2 blocks of cream cheese that were solid but slightly soft. The cakes were completely cool. I had wrapped then and cooled them in the freezer. I put the cake back in the freezer after I iced it and added coconut. The cake was DELICIOUS!! We ate it BEFORE Easter dinner! I will have to figure out what in the world I did with the icing. 🙂 Thank you for the recipe! It is definitely a keeper! I’m so glad it turned out ok. The taste is the most important part! I had my own fail with a lemon meringue pie this weekend so I can totally sympathize! Did this baker use a good quality cream cheese? I have learned by trial and error that you cannot use store brand cream cheese for a good frosting. The store brand is runny and does not hold it’s consistency! Thank you Janice, another baking friend of mine pointed this out the other day. She also wondered if people were using the block of cream cheese or the stuff in the tub (which is runnier). I need to update the tips in the recipe to note this! I searched our groceries for fresh frozen coconut and could not find it. so…..I bought a whole one and struggled through that process. I did not get very much coconut. Can you give me a heads up where to find it? I usually find mine at Food Lion. Other people have commented that they found it at Walmart, and chunks of fresh coconut (that can be grated) at Trader Joe’s. I hope that helps. Often if you ask your grocery store to order it for you they will. It is worth a try! I’m so sorry to hear about the icing. I don’t know what could have gone wrong. Hopefully you still enjoy the cake. I made the cake in four short layers. I mixed half the ingredients for the first 2, then mixed the rest of ingredients for layers 3 and 4. Each layer was soft, moist,and had a bounce in the top. They cooked in 25 min. I used buttered parchment paper on bottom. Oh, and I mixed all wet ingredients together. Then using a hand mixer, belended wet INTO dry. I beat for around 2 minutes, before filing pans. Thank you! We had a lovely Easter! Also, I used the frosting recipe without adding milk. It was perfect too! My friend made the cake in 2 large layers for her son’s birthday! She sent me the recipe! This was the MOST amazing cake EVER!!!! I made this for my son’s 25th birthday. I usually do a trial run for any new recipe I haven’t tried out, but I didn’t have time. Big mistake! I used the frozen coconut (thawed) and froze the frosted cake overnight like suggested. While thawing, it leaked all kinds of coconut juice, so much so that even the cardboard cake plate was soggy. I kept using paper towels to blot up the liquid at the bottom, but this went on for hours.The cake itself was delicious, but the soggy, leakiness didn’t make for a great presentation. I’m thinking the problem was with the fresh coconut having so much moisture. Next time I would probably just use the regular dried stuff. 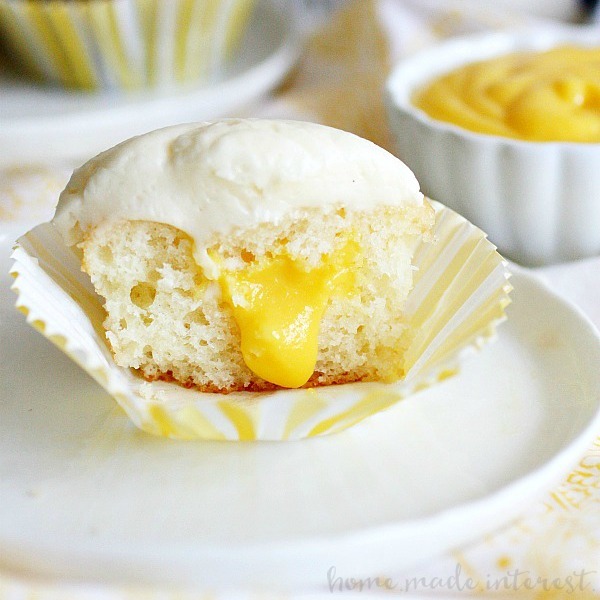 BTW–I used pineapple extract in the cream cheese frosting and it was a delicious complement to the coconut flavor. DISASTER!! Followed directions exactly. The cake layers baked beautifully but were crumbly when removed from pans. Wondered how I would frost the sides. Answer, I couldn’t. The icing was so runny that it destroyed the layers. Icing ran down the sides and took chunks of cake with it. 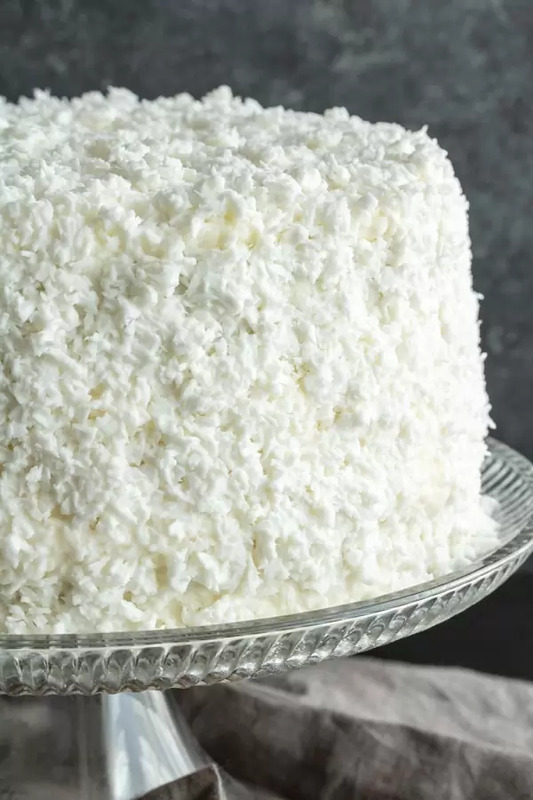 Needless to say, I didn’t waste my time or the coconut by trying to put it on the cake…there was nothing left for it to stick to. The whole mess went into the garbage. Very disappointing and a waste of time and money. I resorted to making pies for Easter dinner. I’m sorry the recipe didn’t work for you. I’ve never experienced the cake being crumbly or the icing being runny. I had a meringue pie disaster myself over the holidays so I can totally empathize with your frustration. I hope you still enjoyed the holiday! I made this cake for Easter April 1, 2018. 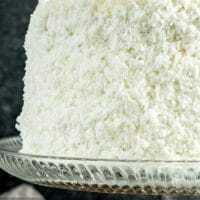 My guests, many of whom love and have eaten many coconut cakes said it was by far, the best coconut cake they ever had. I, too, experienced a mess while frosting the cake. I only used 1-2 Tbsps of milk. I will eliminate that next time. It was an unbelievable slip and slide show. It took my husband and me working Together to get it wrapped and into the freezer. I used the icing in between the layers. Had some left over and I kept it in the frig. After it was in the freezer for two days, I removed it an patched it up with the left over icing. It was gorgeous and delicious. The icing was easier to work with and it was never compromised by being in a bowl in the frig for two days. Here’s what I did with the coconut. Thawed it out, put it in the oven on a cookie sheet to dry some and blotted it with paper towels. What I will do next time is thaw the coconut ahead of time and allow it more time to dry out, maybe a whole day. Also, I will refrigerate my baked cakes before frosting to really make them cold. I will also chill the icing in the frig. Putting it on the chilled cakes. It will take a bit longer to complete, but the results will be worth it. It really is delicious! I bought the fresh coconut in the freezer dept, fruit section, of the grocery store. I found the coconut cream with the drink mixers section. Also, a liquor store may carry both the coconut cream and coconut milk. Make sure you have the coconut cream. Now that I’ve made it once, I feel confident that next time will be easier. Just plan to take your time. This masterpiece deserves it. Good luck. Thank you so much for taking the time to write up your thoughts and suggestions. I’m so glad you liked it ! Should you have not used cream of coconut. Not coconut cream. I think she meant Cream of Coconut since she found it in the drink mixer aisle. 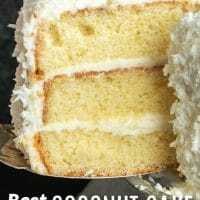 Is there a substitute for coconut milk or coconut cream? Trying to save myself a trip back to the store tonight. I unwrap mine and leave it out on the counter to defrost. You are going to love it!! This cake was dry! Not moist at all I won’t make it again! Hi Joanie, I’m sorry you had a problem with the cake. If it is dry it was most likely overbaked. I too am having problems with the frosting. This is my second go at it and it is still runny. After reading reviews, I’ve tried tweaking it a bit but with no luck. It’s currently sitting in the fridge along with the cakes in the hopes that once everything is nice and cold, it will spread without running. My question is this: “How is this a “buttercream” frosting when there is no butter in it?”. Unless the ingredients are incorrect, wouldn’t this be a “cream cheese” frosting? Also, since you have no issues with the frosting, I was wondering if you would be so kind as to explain the process you use to make it. Do you dump all ingredients at once? Do you whip the cheese first? How long do you beat it? Do you do it by hand or with mixer? Sometimes these little things make all the difference. Thank you. I made this cake for Easter and it ran and dripped all over the fridge. I managed to salvage it as best I could and served it anyway. After being teased about my “Storm Trooper helmet” cake, we all enjoyed it very much. It may not have looked that great but everyone just LOVED it! Hi Anna, I make my cream cheese frosting by adding the powdered sugar and cream cheese to the bowl of my stand mixer and, using the whisk attachment, I whip them together until they are fully mixed. This makes a very thick mixture since no liquid has been added. Then I add my vanilla and continue mixing. Then one tablespoon at a time I add milk. As the instructions say you may not need all four tablespoons of milk. Start with one, continue mixing and see what the consistency is, if it isn’t quiet spreadable add the next tablespoon of milk, and so on until you reach a smooth, spreadable (but not runny) texture. Since you are having problems with it running my only thought would be maybe too much liquid was added? You could add it by the teaspoon if you prefer to take it more slowly. Just make sure to fully mix in between each addition of liquid to check the consistency. I re-read this recipe and I see that it does say cream cheese frosting. I must have gotten my recipes mixed up. Anyway, even though the frosting was still a bit soft and runny, it was nowhere near as bad as last time. Definitely only doing a two layer next time. I followed this recipe to the T and it was perfect!! Very moist and the icing was the perfect consistency. Definitely a favorite!! Thanks Sherri, I’m so glad it turned out perfectly and you loved it as much as I do!! I just wanted to let you know that I made this cake this past weekend for my son’s 19th birthday. We are all big coconut fans. I started to make Ina Garten’s recipe,and then I realized it called for 7 sticks of butter…so, uh, no. I saw yours and bought the ingredients before reading the comments. Then I sort of panicked. However, my fears were unfounded. This cake is delicious! I had none of the frosting issues other mentioned.I did NOT add milk to the cream cheese/powdered sugar recipe, but I did make sure the cream cheese was still a little on the cold side. I used an electric mixer. I was worried because the fresh frozen coconut (purchased at a local Asian market, but we have a lot of those in Southern California) wasn’t that tasty by itself. However, it was magnificent on the cake.Genius idea. I did not freeze that cake–it sat in a plastic “cake box” for over 24 hours before I served it. Half the cake is now frozen, and my son took a hunk today and it was amazing just frozen (no thawing necessary). Anyway, thank you. I will make it again! Mary thank you SO much for taking the time to let us know how the cake worked for you. I can’t tell you how happy it makes me to hear everything went smoothly and you loved it as much as I do!! 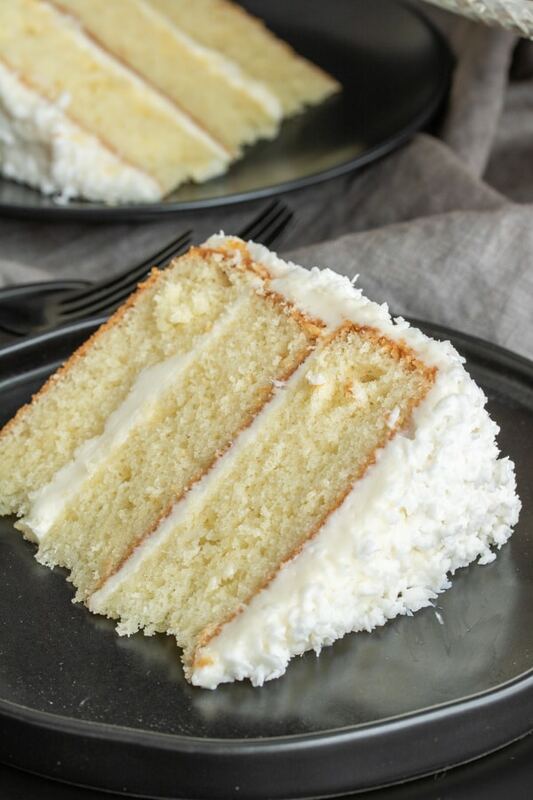 The cake does not taste like coconut, it tastes like a vanilla cake. 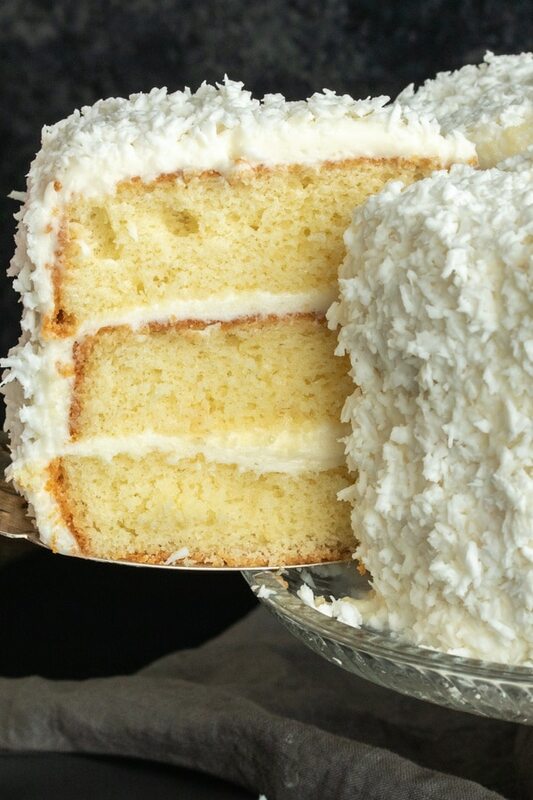 The frosting has a mild coconut flavor but it is very sugary and slightly runny. I did not add milk. It makes a HUGE three layer cake. 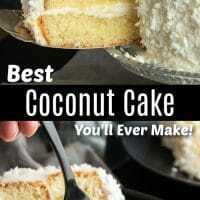 I am still looking for “the best” coconut cake recipe. Has anyone used plain Greek yougurt rather than sour cream? I’m so sorry you had that experience. I cant think of why the cake would implode and fall apart. I hope you still had a happy mother’s day. The advertisement is true! 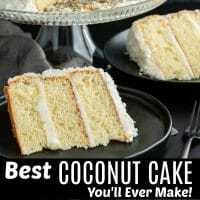 This is the best coconut cake you will ever eat! My guests raved about it. I made one change. Cut each of the three cake layers in half (lengthwise) and added a layer of raspberry filling. Then frosted with the cream cheese frosting. It is fantastic! OMG the raspberry filling sounds amazing. I’m going to have to try that next time! Hi can I make cupcakes instead of the cake with this recipe? 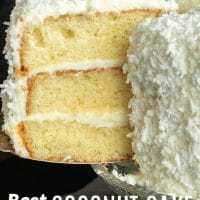 I love this recipe of your coconut cake! 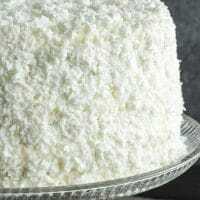 My Grandmother always made coconut cake during the holidays and us kids would couldn’t wait for a piece of that moist cake! I try and make one during the holidays but never found one that compares to hers until I came upon yours! It’s so moist and definitely reminds me of my grandmas (Mamaws) receipe she made. Thank you for posting this in your blog. Love my Coconut! Thanks so much for taking the time to leave a comment. I can’t tell you how happy it makes me to hear you liked the cake and that it brought back memories of your mamaw too!! 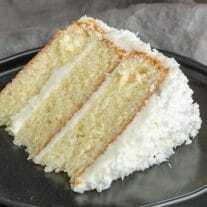 Do you think I could use coconut cake mix instead of white and still use the cream of coconut. I really want the coconut flavor to stand out. Thanks, can’t wait to try this:) ! Made this for a special friend’s 75th birthday! It was delicious! I mixed icing without adding the milk and refrigerated it until the layers were cooled. So yummy, Thanks for sharing the recipe! Hi. 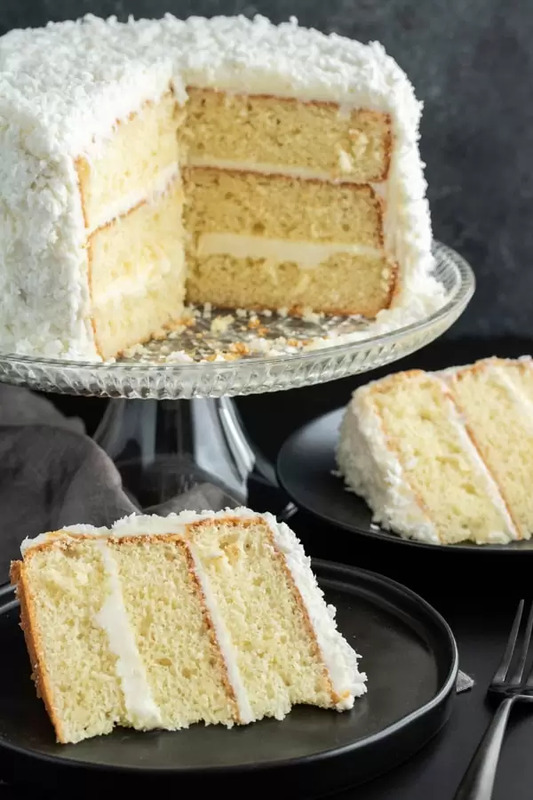 I’m planning on making this cake a day ahead of when I need it and I was wondering if I need to keep it in the refrigerator? I don’t plan on freezing it since I’ll be serving it the next day. Yes, I would keep it in the refrigerator. I have a friend (guy) who is single and loves coconut! 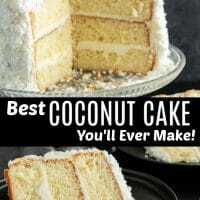 He asked me one day if he bought the stuff would I make him a coconut cake? I said of course and searched for a recipe( me,my husband, and both of our boys do not eat coconut at all) because I certainly didn’t have one. I found yours and decided to try. It took me and my husband to mix this cake…..all I have is a cheap hand mixer which between the icing and the cake we almost burnt up???? when we iced the cake the icing was runny and wouldn’t stay on so we did the best we could stuck it in the fridge and waited 30 minutes…took it out,did touch ups and stuck on the coconut…….put in freezer overnight……we took it to him the next day we had like 20 people eat some and still had cake left over. Hi Regina, I’m so glad you and your friends and family liked it!! Did you use a block of cream cheese for the frosting or the kind in a tub? Still trying to figure out why it doesn’t work for some people… Yes, 2 layers is only 1 box of cake mix. All of the ingredients are cut in half. I have the recipes in the notes section of the recipe card. Kat, I have been looking for Miss Donnie’s recipe ( an old family friend from NC) and this looks just like hers. I will try it and let you know. Hers was the best ever!! Thanks for sharing. I hope you’ve found it. I absolutely love this cake! Just made the cake. 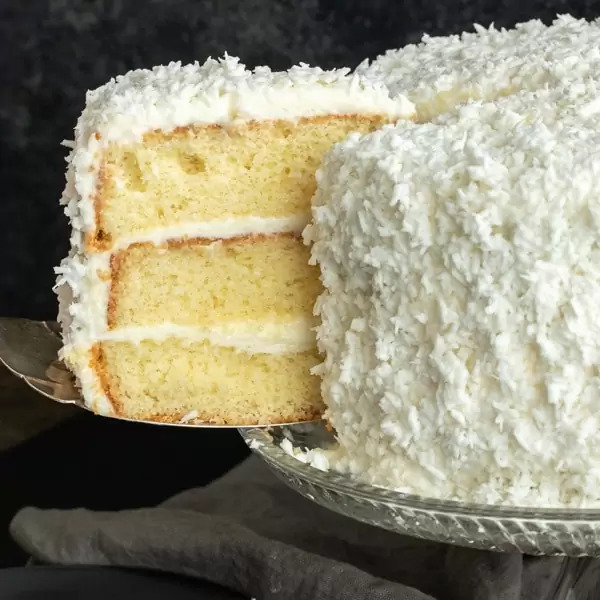 Is the cake going to have a coconut flavor? I tasted the batter and I didn’t taste coconut. 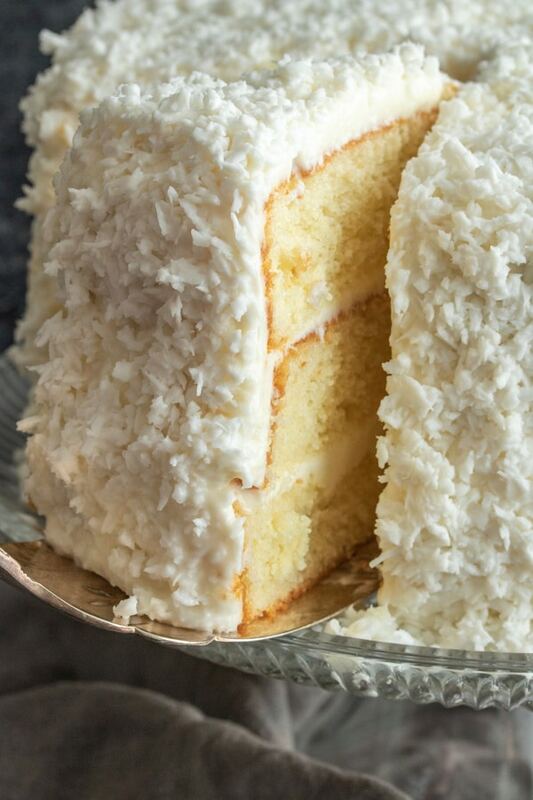 Laura, the coconut flavor comes from the fresh coconut that coats the outside of the cake. This recipe is fantastic, best I’ve ever made. Friends at work are constantly asking for another AIG. Will do the freezer step with all my cakes from now on. So moist. Is it ok to just use egg white?? I have made this several times. It is always a BIG hit. So good. I make in 9×13 pan and basically cut recipe in half. Make sure to use coconut cream not milk there is a difference. I do use coconut extract in frosting along with vanilla. It is my most requested cake.